Try nettle or coriander pesto as a tasty alternative to chives. 2. To make the pesto, place the chives, sage, garlic, pine nuts and olive oil in a food processor and blitz until it’s a coarse purée. Check the seasoning and set aside. 3. To prepare the chicken, slide your fingers under the skin to separate the skin from the breast, then spread the pesto under the skin. Place the halved lemon into the chicken cavity and add a heaped tablespoon of pesto too. Tie the legs together with kitchen twine if desired. 4. Scatter the vegetables over the bottom of a roasting tray. Season with salt and pepper, drizzle with some pesto and add the rosemary sprigs too. Place the chicken on top of the vegetables and pour in the warm stock. Roast in the oven for 1½ hours. To test if the chicken is done, slice it between the leg and the breast – if the juices run clear, then the chicken should be cooked. 5. 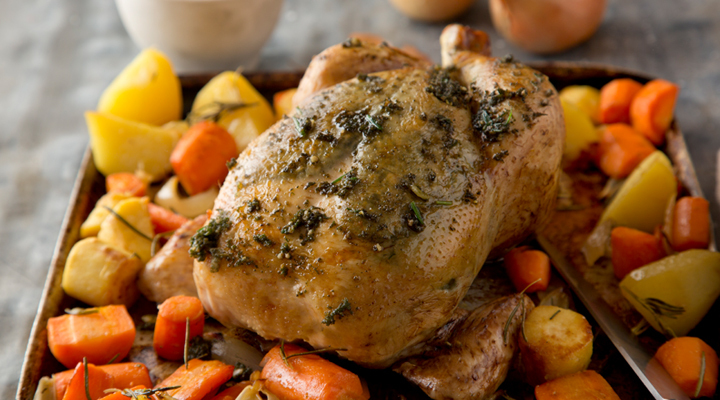 Carve the chicken and serve with the roasted vegetables and a bowl of the leftover pesto on the side.